This post was updated to include a statement from Lockheed Martin. 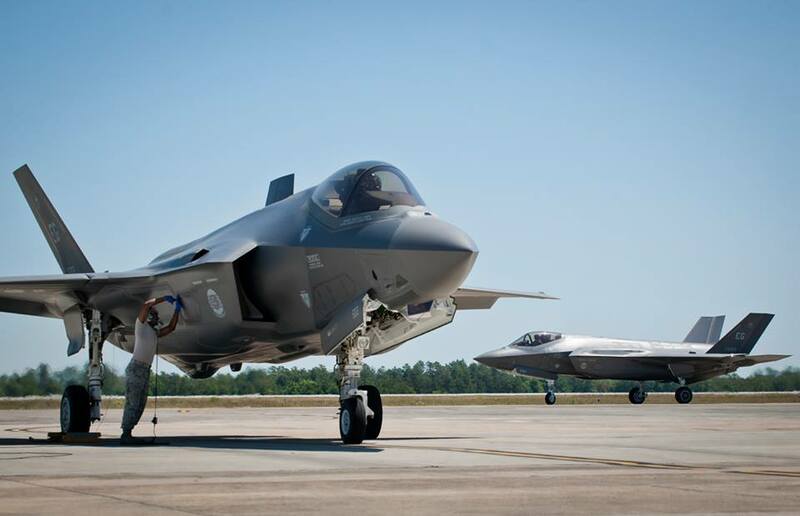 A Lockheed Martin F-35 Joint Strike Fighter was severely damaged — possibly destroyed — in a Monday morning fire on the runway at Eglin Air Force Base, Fla., USNI News learned. No injuries were reported and officials have begun an investigation into the incident, defense officials told USNI News on Monday. “The aircraft was preparing to conduct a continuation training mission at the time of the incident, but aborted during takeoff at Eglin Air Force Base due to a fire in the back end of the aircraft,” according to a Monday statement provided to USNI News from the Air Force. The aircraft was a F-35A — the Air Force variant of the fighter — assigned to the 33rd “Nomads” Fighter Wing. The wing is schoolhouse for all versions of the JSF and trains sailors, airmen and Marines. “We have a robust and extensive training program in which every pilot and aircraft crew member is trained in order to respond quickly and correctly in the event emergencies occur,” said U.S. Navy Capt. Paul Haas, the 33rd Wing vice commander in the statement. The base had trained for a F-35 ground fire as recently as mid-May, according to a separate release from Eglin. “We are aware of the event at Eglin AFB today involving an F-35A aircraft. The aircraft is in the very capable hands of the 33rd Fighter Wing,” a Lockheed Martin spokeswoman said in a statement to USNI News. This is the first incident this severe for the JSF during the life of the tri-service program. There are currently 104 Joint Strike Fighters in the U.S. inventory — split between U.S. Air Force, U.S. Navy and U.S. Marine Corps variants, according to information from Lockheed. Eglin — located on the Florida panhandle — is the home the training centers for pilots and maintainers for all three U.S. variants of the JSF as well as international vairants. The 33rd was designated as the F-35 schoolhouse in 2009 and received its first F-35 in 2011. The wing is set to receive an estimated 59 aircraft by 2018. The wing is part of the larger F-35 Integrated Training Center which plans to have annual output of 100 pilots and 2,100 by 2018. The JSF fleet was grounded earlier this month after a Marine variant of the aircraft suffered an engine oil leak in flight. Dave Majumdar is a long time defense writer. Sam LaGrone edits USNI News.